The foothills of the Alps. Beautiful Casey. I like your use of grays to play up the accents. Nice composition too. I say that after producing one horribly unbalanced watercolor. I couldn't recall what I had read in your symmetrical discussion the other day. I abandoned ship. I know the asymm/symm posts were long, which is what I've been avoiding. I guess I had more to say. I'm going back to short and sweet. writing the one on rhythm, now. i love how the village is dwarfed by the mountains. Of course your colors are still very evident and maybe more so because of the grays. It is wonderful how with just a few strokes you are able to paint the structures. this is wonderful! Thank you for all of your comments, Sara. Lorie just took the formal photo of this not a half hour ago, so I can update these iPhone images and show them better. 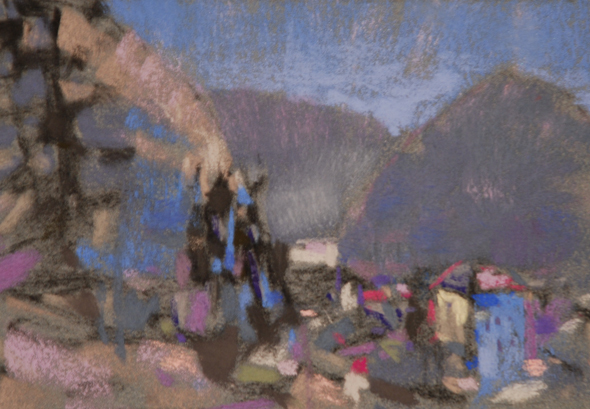 Light in The Coulee @9" x 9" Pastel Casey Klahn February 12th. My Blog on Fine Art, the Artist's Process & New School Color.